Bespoke embroidered ladies handkerchief with gift box and personalised ribbon. Personalised cotton handkerchief with butterfly lace corner embroidered with a rose motif and a special message, phrase or poem. 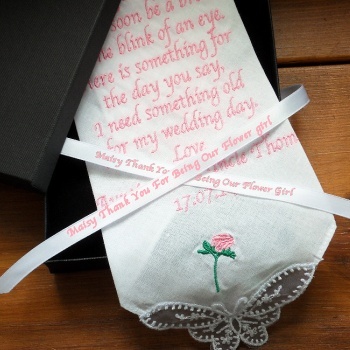 Personalised cotton handkerchief with butterfly lace corner embroidered with a rose motif and a special message, phrase or poem. A special gift for weddings, ceremonies or birthdays. The text will be custom embroidered in a letter font style, thread colour and handkerchief style of your choice. Please select from the available options and add this item to your basket and checkout then email us your poem or message. Up to a maximum of 45 words. The gift box is tied with a personalised satin ribbon printed with a brief message such as the occasion (Happy Birthday etc...) or perhaps who the gift is to and from. Please include the details for the ribbon in your email. We can sew your own poem or the traditional flower girl poem; Today you're young, the years pass by. You'll soon be a bride in the blink of an eye. Here is something for when you say, I need something old for my wedding day.